The jury in the murder trial of George Zimmerman on Saturday acquitted the former neighborhood watch volunteer of all charges in the 2012 fatal shooting of 17-year-old Trayvon Martin during a scuffle in a gated Florida community. The six-woman jury announced its verdict of not guilty at about 10 p.m. ET, after more than 16 hours of deliberations over two days. We’re following the reactions to the verdict in a separate blog post. Zimmerman, 29, had been charged with second-degree murder and manslaughter in the shooting of the unarmed African-American teen whose death shed light on Florida’s “Stand Your Ground” law. Zimmerman had claimed self-defense in the shooting, and said it occurred during a sidewalk fight. Prosecutors had portrayed Zimmerman as a “wannabe cop” who “profiled” Martin and “automatically assumed that Trayvon Martin was a criminal” even though the youth was not trespassing in the gated community where the deadly confrontation took place. 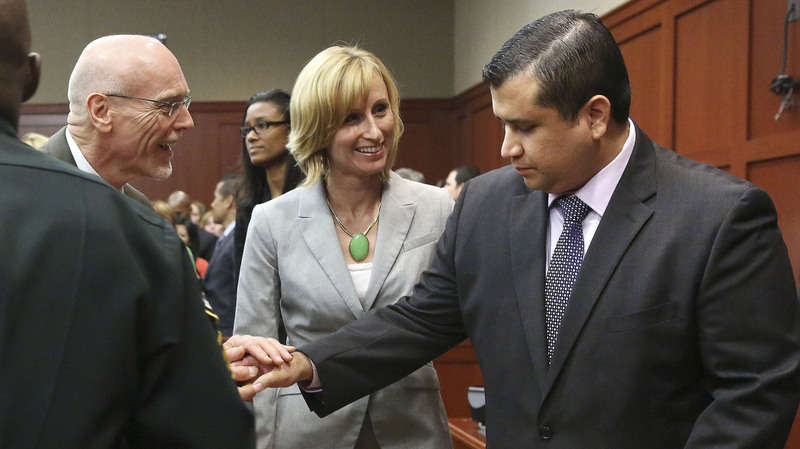 Shortly after the verdict was announced, Judge Debra S. Nelson of Seminole County Court in Sanford, Fla., told Zimmerman he was free. The six-woman jury announced its verdict of not guilty at about 10 p.m. ET, after more than 12 hours of deliberations over two days. The jury in the George Zimmerman murder trial says it has reached a verdict. An announcement on its verdict is expected shortly. At 5:51 p.m. ET, court spokeswoman Michelle Kennedy tweeted that the court would convene for “jurors’ question.” The jurors sent a note to the judge asking for clarification on the charge of manslaughter, The Associated Press reports. The court is now back in recess. Jury deliberations in George Zimmerman’s murder trial entered their second day on Saturday after three weeks of testimony centered on events surrounding the 2012 fatal shooting of 17-year-old Trayvon Martin during a scuffle in a gated Florida community. Meanwhile, police in Sanford, Fla., the Orlando suburb where the shooting took place, were pleading for calm regardless of the verdict in the racially charged trial. “There is no party in this case who wants to see any violence,” Seminole County Sheriff Don Eslinger said Friday on national television as the case went to the jury. “We have an expectation upon this announcement that our community will continue to act peacefully,” he said. In closing arguments on Thursday and Friday, the defense sought to portray Zimmerman, 29, as a civic-minded neighborhood watch volunteer who tried to protect himself from an aggressive Martin. Prosecutors said Zimmerman was a “wannabe cop” who falsely profiled Martin as a criminal, then pursued and killed him. The sequestered jury, all women, deliberated for more than three hours on Friday before adjourning for the day. They resumed Saturday morning. The six jurors have the option of acquitting Zimmerman or convicting him either of second-degree murder or the lesser charge of manslaughter. We will update this post if there’s a verdict or any other significant developments in the case as the day goes on.